A drought map for July 17, 2018, shows that much of the southwestern part of the state is suffering from "exceptional" or "extreme" drought. 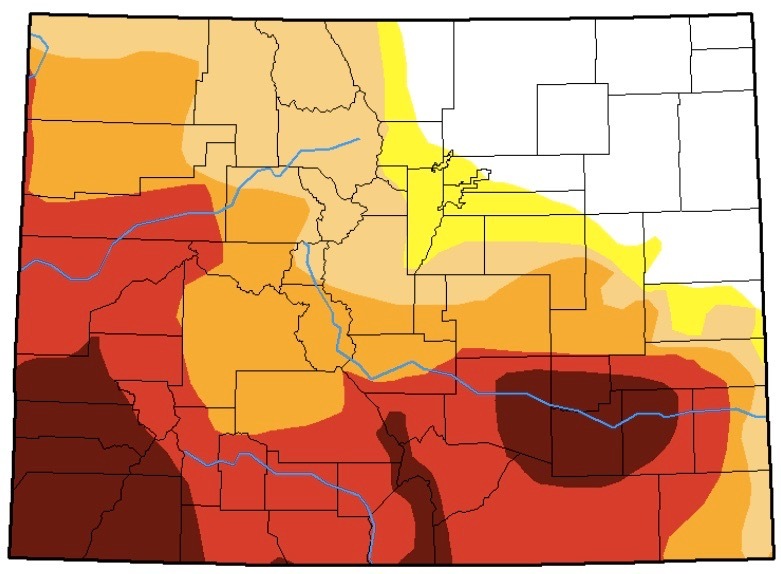 Pitkin County is seeing some "extreme" drought in the western corner of the county and "severe" drought throughout. GLENWOOD SPRINGS – More than 30 water managers and state officials gathered in Glenwood Springs last week for meetings of the Colorado Water Conservation Board and the Colorado River District, and most of them struggled to find good news to share with their colleagues. Instead there were tales of low flows, dazed fish, stunted crops, discouraged ranchers, idle fly-fishing guides, early cattle auctions, burnt forests, and rivers and streams blackened by ash runoff. “I’ve got to chime in on drought,” Mike Sullivan, the deputy state engineer at the Colorado Division of Water Resources, said Wednesday morning when various state officials were giving their reports. And what water is left is too warm, said Jackie Corday, the manager of the water resource section of Colorado Parks and Wildlife. “In rivers within every basin, daily water temperatures have exceeded 70 degrees, which you know is a scary thing for fish,” Corday said. She also said the state may change the voluntary fishing restrictions on the lower Roaring Fork River, where people are being asked to stop fishing after 2 p.m., and move to a hard closure. “We’re also looking at going beyond the fish before 2 p.m. rule right now,” she said. Don Brown, the commissioner of the Colorado Deptartment of Agriculture, said the lack of rainfall is making it harder than usual on ag producers. 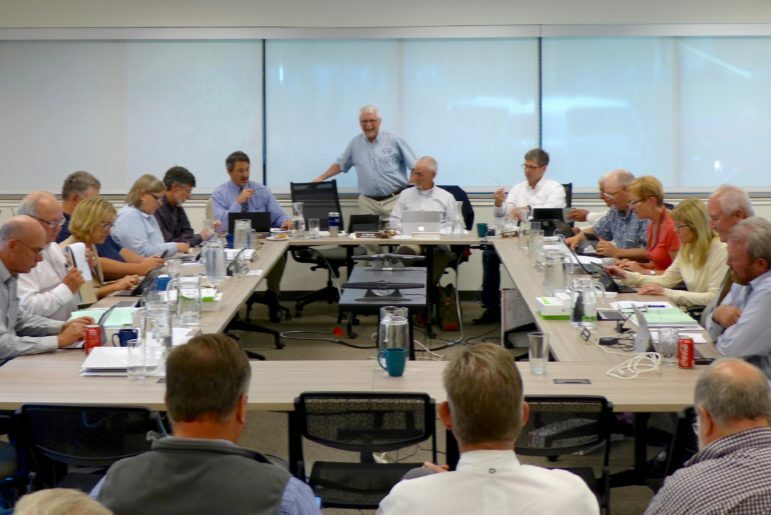 The directors of the Colorado River District in Glenwood Springs on July 17, 2018, during a two-day quarterly meeting. Like their counterparts on the CWCB board meeting across town, the board members heard how low water supplies and high water temps are hurting ranchers, farmers, anglers, and boaters. Also Wednesday, the board of the Colorado River District, which spans 15 Western Slope counties, was holding its regular quarterly meeting at its headquarters near Two Rivers Park in Glenwood Springs. Marc Catlin, who represents Montrose County on the river district board and also is a Colorado state representative from House District 58, said the sweet corn in Olathe was coming in about two weeks early and irrigators near Montrose were working with about 70 percent of their usual water supplies. But to the south and west, in the San Juan and Dolores river basins, Catlin said conditions are much worse. Karn Stiegelmeir, who represents Summit County on the river district board and is a Summit County commissioner, said both the Blue and Colorado rivers are experiencing “unprecedented temperatures,” making it hard for fish to survive. “And so our outfitters are devastated because they just don’t have the ability to do their business all summer, taking people out on fishing trips,” she said. And Alden Vander Brink, who represents Rio Blanco County on the river district board, said a huge algae bloom on the White River is choking the river. 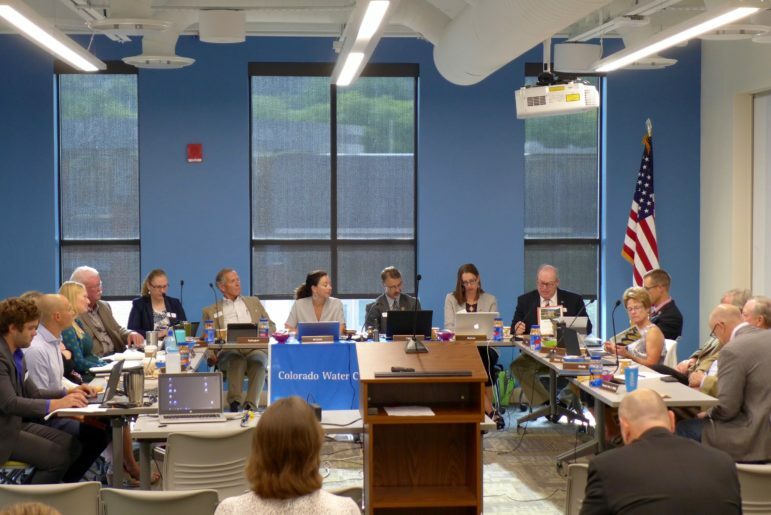 Directors and staff of the Colorado Water Conservation Board meeting on Thursday, July 19, 2018, in Glenwood Springs, as part of their practice of meeting in different river basins in the state. Many of the directors serving on the state agency’s board said a lack of water in the Colorado was now hurting both the agricultural and recreational sectors. On Thursday morning, the CWCB board again assembled in a meeting room in downtown Glenwood Springs. Steven Anderson, the manager of the Uncompaghre Valley Water Users Association and a fourth-generation farmer in the valley, told his fellow board members he, too, was seeing early corn, unusual cattle and sheep auctions, and shrinking water supplies. Celene Hawkins, who represents the San Miguel, Dolores, Animas and San Juan river basins on the CWCB board, told her fellow directors good news was in short supply. Hawkins is director of the Western Colorado Water Project for The Nature Conservancy and lives in Durango, which has been dealing with the 416 Fire and its aftermath. Other water managers showed pictures or discussed other fires around the state, including the billowing Lake Christine Fire in Basalt above the Fryingpan and Roaring Fork Rivers, the huge Spring Creek Fire near La Veta Pass that could impact rivers and streams in both the Arkansas and Rio Grande river basins, and the well-contained Buffalo Mountain fire in Silverthorne near the Blue River. Editor’s note: Aspen Journalism is collaborating on the coverage of water and rivers with The Aspen Times. The Times published this story on Monday, July 23, 2018.